We just celebrated Mother's Day and next month we'll celebrate Father's Day. It's a good time to study our relationship and responsibilities toward parents. God included it in His 10 Commandments, and He lists disrespect for parents in several lists of wicked attitudes (2 Timothy 3:1-5; Romans 1:28-32). Yet many Christians prefer the world's "fifth commandment" which goes something like this: "Parents, honor your adult children. Have no expectations. Give them what they ask. Keep your advice to yourself. Then it might go well with you." There's an alarming trend in our world of adult children neglecting, rejecting, blaming, and estranging parents, even using grandchildren as pawns to punish or manipulate their parents. Jesus says we can't honor Him if we're dishonoring our parents (See Matthew 15:3-9). If we're treating our parents with less respect than our friends, we aren't listening to Scripture. When we honor our parents, we honor God. 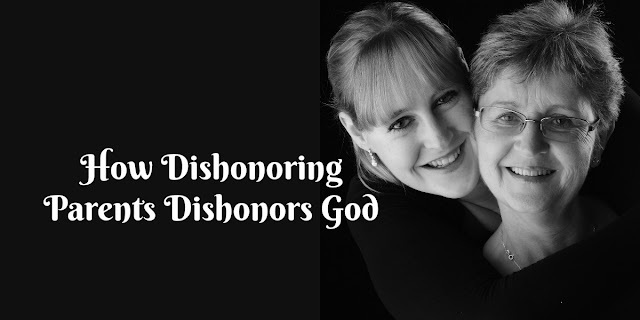 When we dishonor our parents, we dishonor God (Ephesians 6:2; Exodus 20). (1) Often Mother's and Father's Day sermons stress a mother's and father's responsibilities more than on our need to honor mothers and fathers. 1. Adult children often excuse their neglect or dishonor of their parents because their parents are difficult people. They are basing their obedience on their parents' worthiness, not on God's worthiness. 1 Peter 3:14: But even if you should suffer for what is right, you are blessed. James 4:17: If anyone, then, knows the good they ought to do and doesn't do it, it is sin for them. 2. When adult children actively seek to honor their parents, it can have incredible impact on the relationship, and the children often realize how much of the problems they created. 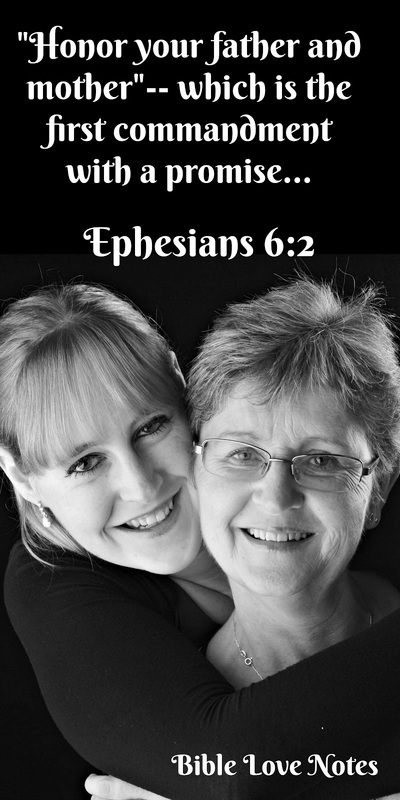 Even if the relationship remains difficult, honoring our parents helps us develop godly character. This Scripture is describing the ministry of John the Baptist, but the mission continues after Christ's first coming. As 2 Timothy 3:1-5 says, disrespect for parents is a sign of the end times. Malachi uses the term "the great and dreadful day of the Lord" to mean the time the wicked are judged and the godly are rewarded - i.e. Christ's Second Coming. Luke repeats this prophecy, using the term "disobedient" in place of "children." Luke 1:17: And he will go on before the Lord, in the spirit and power of Elijah, to turn the hearts of the parents to their children and the disobedient to the wisdom of the righteous--to make ready a people prepared for the Lord." 2 Timothy 3:1-5: But mark this: There will be terrible times in the last days. 2 People will be lovers of themselves, lovers of money, boastful, proud, abusive, disobedient to their parents, ungrateful, unholy, 3 without love, unforgiving, slanderous, without self-control, brutal, not lovers of the good, 4 treacherous, rash, conceited, lovers of pleasure rather than lovers of God— 5 having a form of godliness but denying its power. Have nothing to do with such people. Disobedience to parents is also listed as an adult sin in Romans 1:30. See the notes about this in Outward Godliness. Sound advice. Much needed today when many adult children feel they know everything more than the parents and put friends above their parents and ruin their lives. i want to ask a question. Is there any scripture in the bible that describe or guides the behavior or conduct of parents towards their children. Yes, Unknown, there are several Scriptures that specifically apply to the way parents treat children and many other passages that apply to the way we treat people in general. I have never heard a parent say that they will not obey one of these commands because their child is not worthy, but I have often heard adult children say they won't obey God's command to honor parents because their parents are not worthy. God expects parents to do the right thing and He expects children to do the right things. It is not dependent upon what other people do. If you are looking for Biblical commands for parents, I encourage you to google it.